(Nanowerk News) A variety of highly innovative, high energy-efficient transport systems are currently under development in Japan. Takashi Sasaki introduces three such transport systems whose practical realization is now more than a dream. 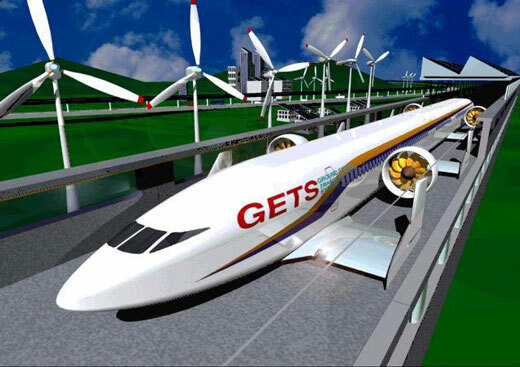 The Aero-Train, currently undergoing research and development by Professor Yasuaki Kohama of Tohoku University’s New Industry Creation Hatchery Center, will fuse aircraft technology with the styling of a railway to float and buzz over the earth’s surface at high speeds using the propulsive force of electric propellers. Serving as the driving force behind the Aero-Train is a phenomenon known as the ground effect, which dramatically improves energy efficiency. When an aircraft flies close to the ground, interference between the wings and the ground surface simultaneously produces a sharp rise in lift, and a significant decrease in drag. Conceptual image of a completed Aero-Train service (with capacity for 360 passengers). If put into practical use, Aero-Trains running entirely on natural energy could cover a distance of approximately 500km in one hour, much faster than conventional bullet trains, while using significantly less energy in the process. In the 1980s, flying boats that would use this ground effect to glide over the water were being actively developed in the former Soviet Union and elsewhere. However, since the fuselage would be subjected to severe impacts that led to serious accidents when it came into contact with waves, the technology never achieved widespread adoption. However, since the Aero-Train will run along a concrete guide-way enclosed by walls on either side, there are no such risks. According to Professor Kohama, the most difficult part of his twenty-five-year research and development efforts has been working out how to maintain levitated travel in a stable attitude [level orientation of the vehicle’s axes]. We are familiar with the risks faced by vehicles such as racing cars that move across the ground at high speeds. When their fronts float upward due to gusts of wind or other forces, the entire vehicle can fly and then flip over. After a lengthy process of trial and error using wireless signals, sensors and other devices, Professor Kohama came upon the solution in the form of an attitude control program embedded in robots that move the way humans do. Using this program, Professor Kohama first managed to produce stable travel by making extremely precise adjustments to the front and back wings of the Aero-Train to control its attitude. “When we managed to achieve stable travel, maintaining an altitude of around ten centimeters off the ground without the left or right wings touching the walls of the guide-way, I was so happy I was moved to tears,” recounts Professor Kohama. The Prototype No. 3 of the Aero-Train is currently engaged in repeated testing on a test course, and last year achieved a top speed of 200 km/h with two passengers on board. The tests have produced promising results—per-unit energy consumption is less than half that of a conventional bullet train, and roughly a fifth of a linear motor (mag-lev) train. When adopted for practical use, the aim is to run the Aero-Train entirely on natural energy by covering the top portion of the guide-way with solar panels obtaining power from a special pantograph. The Aero-Train is being targeted for practical application sometime between 2020 and 2025. Based on these research results, concepts for introducing the Aero-Train around the world have been produced, with possible uses including shuttle-type lines that would link outlying airports with city centers at speeds of 500 km/h. CO2 emissions from international shipping have now reached 840 million tons per year. This represents just under 3% of worldwide CO2 emissions. With the volume of worldwide trade expected to increase in the future, reducing CO2 emissions in marine transport is an issue of critical importance. A model of the NYK Super Eco Ship 2030. Given these circumstances, Nippon Yusen Kabushiki Kaisha (NYK Line) has envisaged the Super Eco Ship 2030 as its next generation of container transportation vessel. As its long-term corporate goal, NYK Line has set itself the challenge of eliminating all CO2 emissions from its entire fleet of vessels by 2050. The practical utilization of the Super Eco Ship 2030, which enables a 69% reduction in CO2 emissions compared with existing container vessels, can be considered a significant milestone on the way to achieving zero emissions. “It’s hard to say precisely when this ship will become a reality. The Super Eco Ship 2030 has been designed as a roadmap making it clear what kind of energy-efficient technologies we need in the long term. In order to promote the practical use of each technology, we have started to adopt some of the technologies on actual vessels in the sea. We conduct research and development on shore as well. We hope the Super Eco Ship 2030 becomes an opportunity for more people to consider problems such as the technologies needed to conserve energy,” explains Tomoo Kitayama, general manager of the Environment Group at NYK Line’s Technical Headquarters. The Super Eco Ship 2030 features a streamlined hull that represents a notable departure from conventional container vessel design. This is to reduce the energy required for propulsion to the utmost limit. The ship is powered by fuel cell-driven motors which are also supported by the energy generated by solar panels that completely cover the top surface of the hull. In addition, when favorable winds are blowing the ship will unfurl sails resembling the wings of a bird so that it can also utilize wind power without waste. Driving the ship with electric power will require a number of future technological advances, such as the development of efficient and compact fuel cells. “We are also actively addressing more immediate challenges such as improvements to fuel efficiency,” says Kitayama. One of those initiatives is an air lubrication system which is also slated for installation on the Super Eco Ship 2030. This is a mechanism that significantly reduces the frictional resistance between the hull and seawater by running air bubbles along the underside of the ship. The system has been equipped on multiple NYK Line hulls of varying shapes to verify the effects during actual voyages. Eco-Ride, which is being jointly developed by the University of Tokyo’s Institute of Industrial Science and Senyo Kogyo Co., is an energy-saving urban transportation system which runs by converting potential energy into kinetic energy. The principles at work are basically the same as for a roller-coaster. The body of the vehicle contains no engines or motors; rather, it coasts downward atop two rounded pipes set on a decline. Professor Yoshihiro Suda, who serves as the director of the Advanced Mobility Research Center at the University of Tokyo, explains the benefits of Eco-Ride. 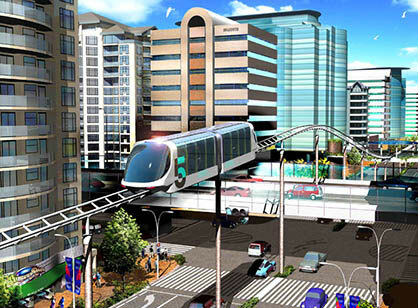 Conceptual image of a completed Eco-Ride urban transportation system. What’s more, a lighter vehicle can considerably reduce track construction costs. The new elevated tracks can be laid above roads and do not therefore require the securement of new land. In that case, the construction costs are estimated to be equivalent to Light Rail Transit (LRT), the next-generation streetcar system that runs over land. The practical application of Eco-Ride envisaged by Professor Suda and his team would involve tracks with a maximum length of ten kilometers and between two and seven carriages each holding up to twelve passengers strung together. At an average speed of 20 km/h, the system could carry between 2,000 and 2,500 passengers every hour. If electric power is used to pull the vehicle up to a height of ten meters with wire cables or other means at every station, Eco-Ride can run a distance of 400 meters, the average interval between bus stops in Japan, without difficulty. The technical hurdles towards practical application have largely been cleared, and all that remains is establishing safety standards as a public transportation system and finding suitable locations for operation. When this can be accomplished, the technology has reached a level where the Eco-Ride can be put into practical use right away. If realized, it would be the world’s first energy-saving urban transportation system to utilize potential energy. Imagine running through the valleys between city buildings while looking down on bumper-to-bumper traffic below… Eco-Ride promises to create a comfortable and eco-friendly urban rail system.